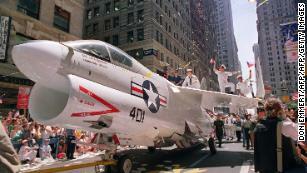 (CNN) President Donald Trump sought to cast blame Friday for the cancellation of his planned military parade on Washington city council officials, saying they had inflated the cost. Soon after the President tweeted, Washington Mayor Muriel Bowser claimed she “got thru” to Trump about costs for the parade, which at one point was calculated to run about $12 million but had soared to an estimated $92 million by the time Trump canceled the event. Bowser, the Democratic mayor of Washington, DC, responded on Twitter to Trump Friday, saying that she is “the local politician who finally got thru to the reality star in the White House with the realities” of holding a military parade. She listed the estimate of parades, events, and predicted demonstrations as $21.6 million. CNN has reached out to Bowser’s office for clarification on what the $21.6 million price tag covers. CNN’s Elizabeth Landers, Abby Phillip, Barbara Starr, Ryan Browne and Clare Foran contributed to this report.